This year we will be heading to my parents house for Easter dinner. Even though my mom said we didn't need to bring along, the girls are going to bake a few sweet treats to bring, as well as try our hand at deviled eggs, thanks to a recipe I got off the back of the Precious Moments Angeled Eggs 10" ceramic serving platter, I was recently sent, along with two super cute two little “egg angel” salt and pepper shakers. This sweet gift is just perfect for Easter, housewarmings or ‘just because’ and adds a fun note of humor and faith to every occasion." Before I share the recipe for super easy, and oh so tasty deviled eggs, here is more about the Angeled Eggs ceramic serving platter from Precious Moments, which would make a great hostess gift if you are heading to a family or friend's house for Easter dinner. 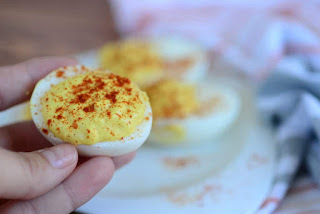 Or, if you love making deviled eggs and have mastered this classic appetizer, that is a staple at most holiday parties, potlucks and BBQ's, then is is a must have to display your tasty deviled eggs. "Easter is a time to spend with family and friends, gathered around conversation and food. 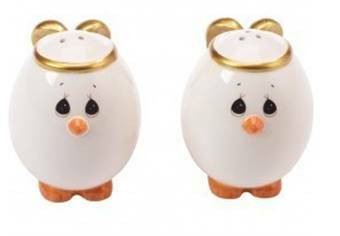 Serve up one of the most popular dishes of the season – deviled eggs – on this lighthearted serve ware from Precious Moments. 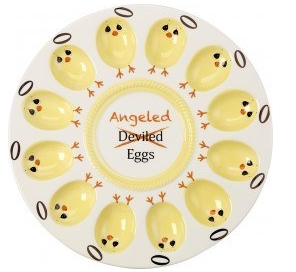 Designed to make you smile, this practical and adorable round platter features cute yellow chicks with halos and a clever message in the center. It holds 12 eggs and is a great way to serve your favorite “angeled” eggs recipe. The platter is also accompanied by two little “egg angel” salt and pepper shakers with Precious Moments eyes and golden wings, adding a smile to every sprinkle"
6 hard boiled eggs (chilled in ice water for 5 minutes, or in a refrigerator for an hour - Don't Skip This Step - This is what I think I have been doing wrong as I never did this. 1. Remove the outer shell and cut each egg in half. 2. Scoop out the yolks and place them in a bowl. 3. Place your egg whites on the platter. 4. Mash the yolks with mayonnaise and vinegar. Add mustard and salt. Mix well. Add black pepper to taste. 5.Scoop mixture into egg white halves with a teaspoon (or use a frosting piping bag for a more elegant look). 6. Sprinkle paprika for decoration and chill until served. If you are hosting an Easter dinner, or need to bring a dish to a family gathering, why not consider picking up the super cute Precious Moments Angeled Eggs 10" Ceramic Serving Platter, and pair the platter with the Angeled Eggs Salt and Pepper Shakers, which look cute next to the platter filled with the above deviled eggs recipe. You can find these and other Precious Moments products which would make for great Easter basket fillers for fans of these collectible figurines by heading over to https://www.preciousmoments.com/.